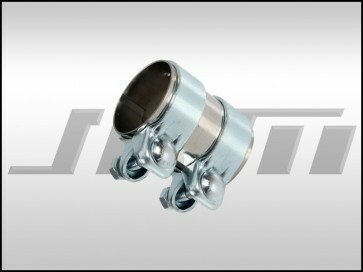 This is a brand new, high-quality replacement 2-bolt exhaust clamp that goes to a B7-RS4 factory sized (60mm) downpipe and cat-back exhaust connection. This clamp is not for aftermarket exhaust systems that do not neck down to fit the stock size. Many aftermarket systems that are designed to bolt to the factory downpipes are necked down and work with this clamp. Price is for each. There are 2 per B7-RS4, if you need both change the quantity to 2 during the check out process or before adding to your cart.